What strap lock do you use? Discussion in 'PTC - PRS Tech Center' started by littlebadboy, Feb 14, 2019. If you use strap locks, which do you use? Mike Duncan and littlebadboy like this. Dunlops, are there any others??? Bill SAS 513 and littlebadboy like this. I've used the regular Schaller for 25+ years without problem so I stick with them. matt3310 and littlebadboy like this. I have Schallers on almost everything. I need to buy stock in the company. Micky!, matt3310 and littlebadboy like this. Antmax and Perry like this. Yep! Chinese flatheads on mine too. Very cheap and not had a problem in 5 years. Antmax and littlebadboy like this. Bought Ernie Ball strap locks once on sale. They worked great so I've put them on all my PRS guitars. I have the gold set on my Burnt Maple Leaf Custom 24, a set of nickle on both my Hollowbody II and Vintage Yellow Cusom 22, and a set of black on my WL Fire-Red to Grey Black Fade 24-08. I've never tried anything else to compare them to, though, so I'm not sure how these stack up against other products out there. Antmax, Wakester and littlebadboy like this. lennon didn’t ever neither did i.
I started off with the Ernie Ball but they cost a fortune. About $18 a pair. I wish they would sell the buttons and locks separately. With 6 guitars and as many straps I got tired of spending all that money and got the Flat head Chinese ones. A pair the first time and a set of 4 for about $10 on amazon one time. The Ernie balls are nice but do have false positives so you have to check that they really locked by yanking on them after they seem to be on. Otherwise they are good and quiet, roll very freely but do stick out quite far. 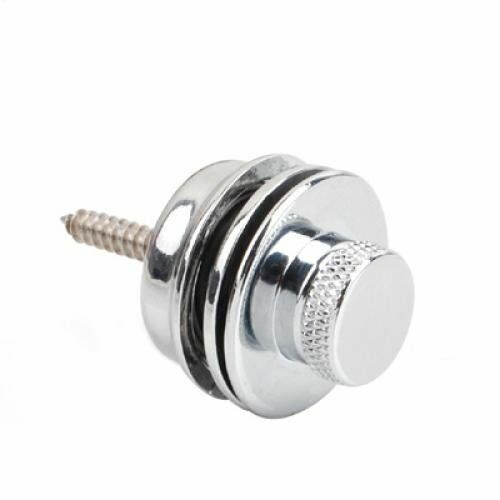 There have been problems with the fender and chinese schaller type ones where the ends come off of a screw and the locks get stuck on the guitar and can't be replaced because the screw is too short and the spring stops you rethreading plus the screw rotates freely because you can't reach the screw head behind the lock when the lock is stuck on. The Chinese flat heads are pretty cool, they don't require any tools to put on because of the knurled bolt on head. I can't see them getting stuck when you can always unscrew the knurled part all the way to disassemble the lock if you have to. You do have to make sure they are tight or they might come loose over time from the strap twisting. It happened to me once so I put blue locktite on the threads. But only the once on one lock. The only thing I'm not that fond of is that they only come in chrome, no Nickel and the buttons the locks lock on to are not tradditional mushroom style ones but shaped like cylindrical barrels. Otherwise they are pretty good. You can see the odd looking buttons in the pic below. Most of those strap locks stick out so far, put so much stress on the body attachment, on the cheaper straps I put a safety pin across the eye hole or a beer bottle type washer over the whole strap button. Staredge and bodia like this. On my Non-PRS guitars/basses (mostly Spector Basses), I use Dunlop, SLS1033BLK. Mainly because if I forget the matching strap with the matching plunger ends, I can put any strap over the Dunlop endpins and feel pretty confidant they won't slip off.